Commemorating 1066 in 1966, a diplomatic dilemma? It is approaching 950 years since William the Conqueror triumphed at the battle of Hastings on 14th October 1066; a pivotal date in England's history. 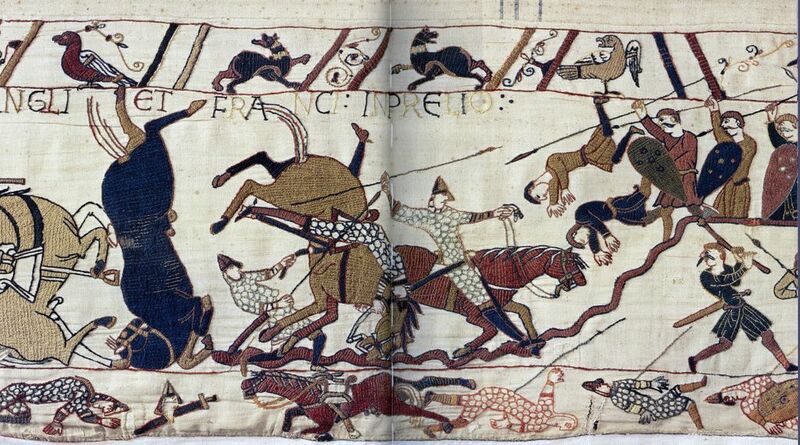 Many know the drama that unfolded in what could be described as a real life historic ‘game of thrones’ played out over the course of the year 1066. 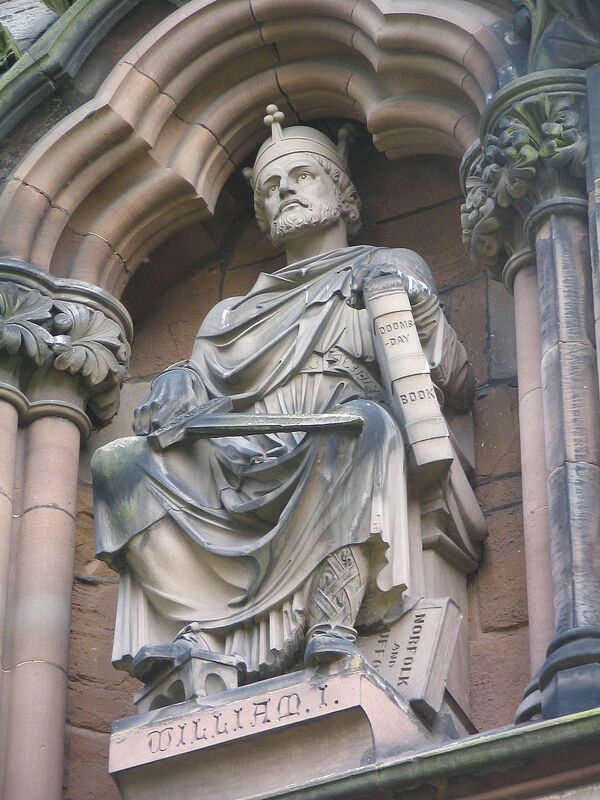 The main characters Duke William of Normandy, Harold Godwinson and the Norse Viking leader Harold Hardrada, who were all portrayed as protagonists and antagonists in the story depending on which chronicler you read, vied for the prize of the English throne in a showdown of violent conflict. The year 1066 and the battle of Hastings changed the course of English and British history forever and the importance of commemorating this monumental battle has not diminished since. However plans to commemorate such a famous episode in the history of England could encounter surprising problems, as officials at the Foreign Office discovered 50 years ago when preparations were under way to celebrate the ninth centenary of the battle in 1966. A committee to co-ordinate activities by local authorities and organisations involved in commemorating the 900th anniversary had been established chaired by General Sir Reginald Denning. 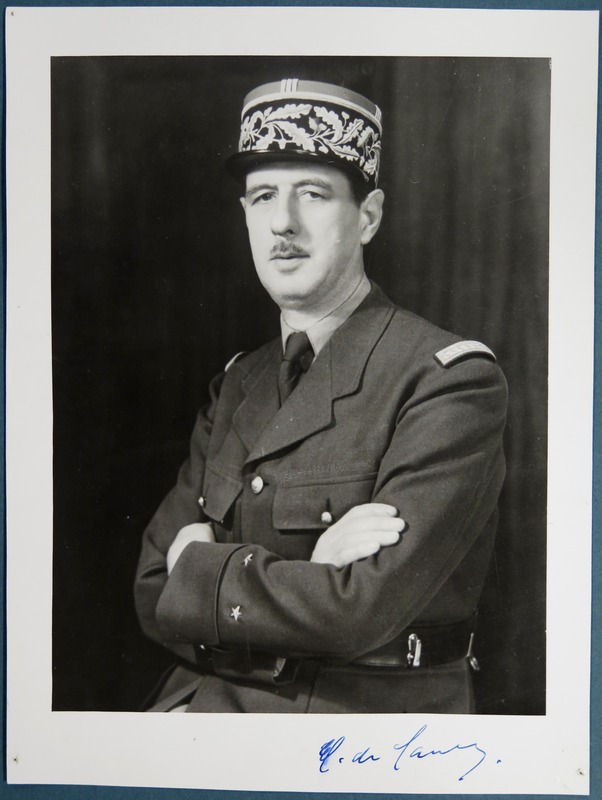 In an enthusiastic gesture to mark the important anniversary, the committee had suggested inviting the incumbent French president Charles de Gaulle to commemoration events taking place in Britain. 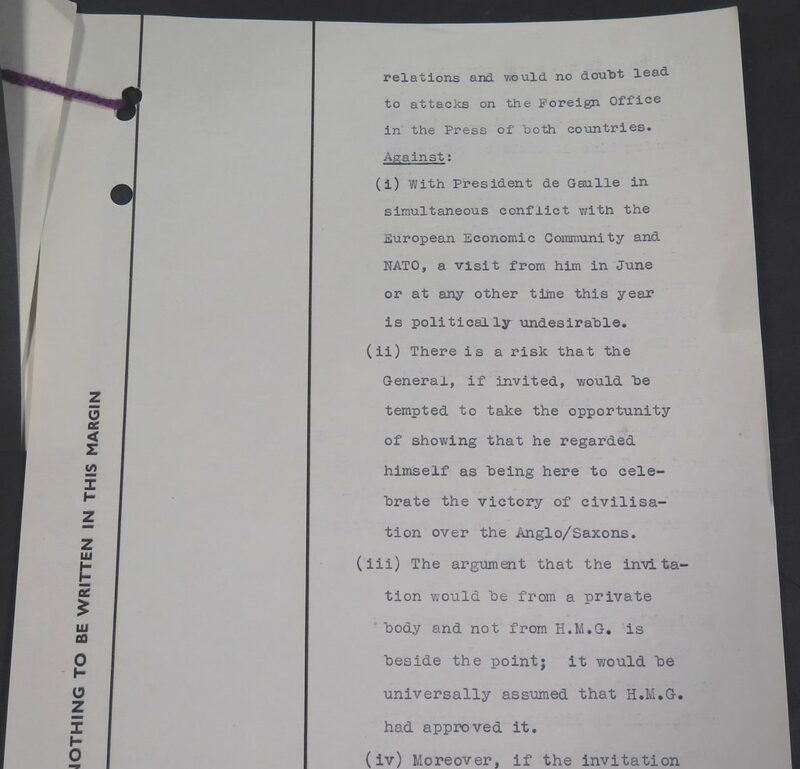 Whilst this was only a proposal it prompted a flurry of correspondence between mildly flustered Foreign Office officials and with the British ambassador in Paris, concerned with the political implications that such a visit would generate. Concerns arose over the sensitive relationship and attitudes of De Gaulle towards NATO and the European Economic Community. The French president was gradually disentangling France from the NATO alliance and by the end of 1965 France had pulled out of SEATO (South East Asian Treaty Organisation) and refused to participate in future NATO military manoeuvres. He also remained opposed to British membership of the EEC, seeing Britain as too close in its ties with America. 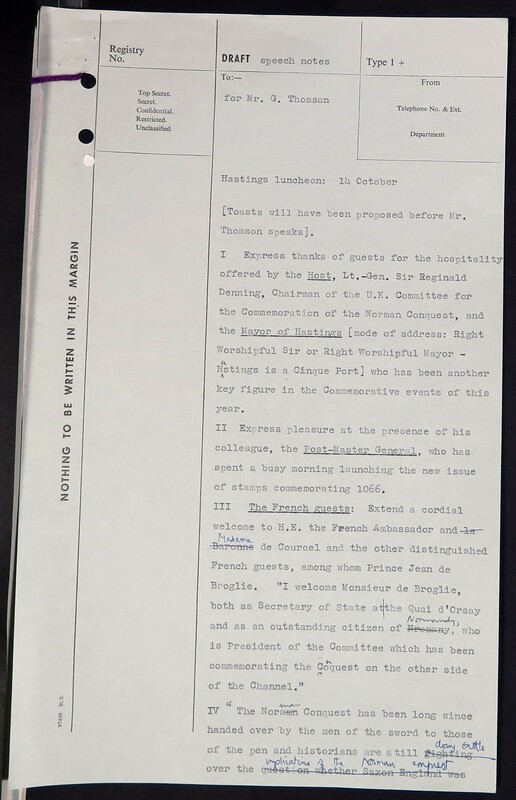 In a minute by private secretary John Nicholls found in FO 924/1629, the arguments for and against inviting the French president were outlined to Foreign Office officials and the British ambassador in Paris. Arguments for extending an invitation to the president included the opportunity to strengthen Anglo-French relations as expressed by Prince Jean de Broglie, chairman of the French commemoration events for the 1066 anniversary. However the minute went on to raise several stronger objections against inviting de Gaulle to commemorative festivities in Britain. Given the current political climate with contention over the European Economic Community and NATO, a visit would be “politically undesirable” at this time. 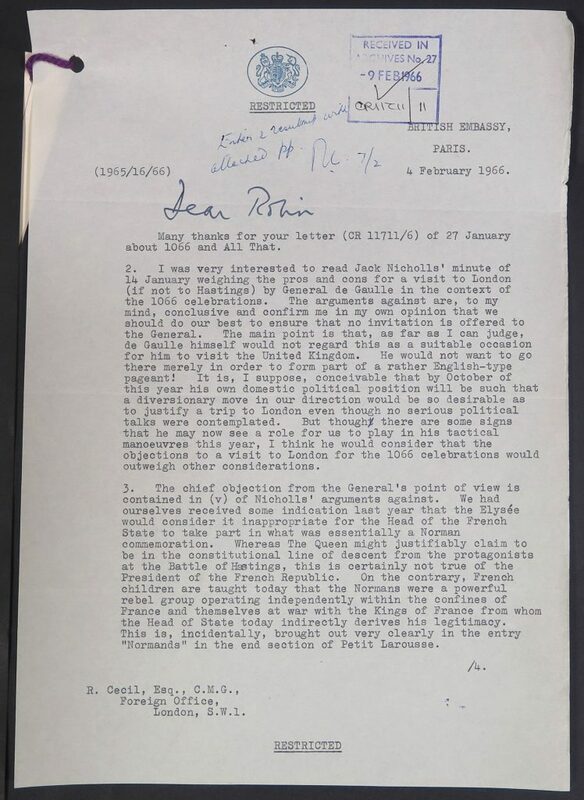 Another major objection put forward in point 6 was that as French commemorations relating to Hastings were taking place only in Normandy and not nationally, it would be inappropriate for Britain to invite the French president to its own events. It was recommended that an alternative representative from the French republic be found and Monsieur Jean de Broglie was named as a suggested candidate. An invitation was later sent to de Broglie to attend a ceremony service at the battle site near Hastings and a banquet hosted by the mayor of Hastings on 14th October 1966 and with relief to all concerned was accepted - the dilemma about the representative for the French Republic was resolved. The events on 14 October 1966 at the battle site included a commemoration service led by the Dean of Battle, an unveiling of a commemorative plaque complete with a guard of honour, a band from the 1st battalion Royal Staffordshire Regiment, and a banquet lunch. Details of the preparations for the day’s events can be found in FO 924/1638. Included in the file are the annotated speech notes to be delivered at the banquet by the right honourable George Thompson MP, Chancellor of the Duchy of Lancaster. The contents of the speech say a lot about the context in which the anniversary of 1966 was commemorated. It had only been 21 years since the end of WWII and George Thompson was keen to highlight the enduring Anglo-French comradeship demonstrated in the war and especially on the beaches of Normandy. He made the point that, as in the year 1066 when William crossed the channel for England, the weather played a crucial role in the timing of the allied invasion of Normandy almost 900 years later. Perhaps the most interesting and final thing to note is the insight into why French attitudes to commemorating the battle of Hastings contrast with the more national character of those in Britain. France in the 11th century was far more provincial and less centralised with autonomous regions such as Normandy, Brittany and Aquitaine governed by semi independent rulers including the Norman dukes who frequently challenged French royal authority. French kings only began to emerge as undisputed sovereign of their territories from the 13th century onwards. This explains why the battle of Hastings is not stamped onto the consciousness of the French nation as an event of national importance in the same way that it is in Britain. In contrast, for the countries of the British Isles, the battle of Hastings changed the fundamental course of their history and its impact would resonate down the centuries.